Beautiful outdoor lighting is a wonderful investment for just about any homeowner. Not only does landscape lighting enhance the curb appeal of your home, it’s also a great way to increase the functionality of your landscape at night, ward off home invaders, and improve the safety of your yard. If you are considering adding outdoor lighting to your landscape, you should first ask yourself, “Which parts of my yard do I want to illuminate?” The answer to this question depends largely on the structure of your landscape and the mood you are trying to create. The most beautiful outdoor lighting works to complement your yard’s existing features and play up its natural appeal. Many homeowners have an idea of the areas they want to illuminate, but they aren’t sure what lighting features can best bring their vision and landscape to life. If you are looking for inspiration for your yard, consider these three beautiful outdoor lighting ideas popular among homeowners and many of our clients. Exterior decor, such as statues, fountains and sculptures, can serve as a beautiful focal point for your yard. If your landscape is home to these kinds of eye-catching adornments, you may want to consider highlighting them with one or both of the following lighting effects. Silhouetting is a great way to capture and highlight the shape (or silhouette) of sculptures and fountains. The effect is created by placing a spread light between the feature you wish to highlight and a nearby structure, like a wall or a fence. The result is a beautiful, black silhouette against a soft, illuminated background. Spread lights give off clean, white light thanks to their bi-pin halogen bulbs and mirrored background. This creates the perfect backlighting effect and allows the shadowed silhouette to really pop in the crisp white light. Shadowing plays off of light and darkness in a different, yet equally powerful way. Once again, this technique is best for features that have a nearby wall or fence. To capture a shadow effect, light your feature from below and angle the lighting upward. This creates a stunning effect that casts a shadow against the background and makes the feature appear much larger and more dramatic than it truly is. When it comes to choosing beautiful outdoor lighting for your yard’s flowers and plant life, the best lighting effect depends on the size of the area you wish to illuminate. You should use an entirely different technique to highlight a single planter than you should to showcase an entire flower bed. 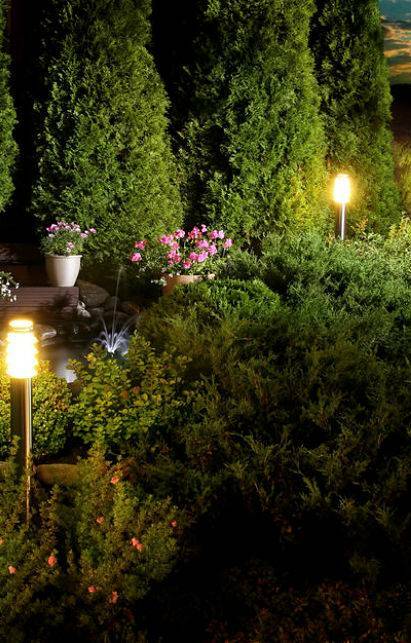 If you wish to highlight large areas of plant life at night, the best technique is to use a series of low-voltage garden lights around the area’s perimeter. This technique creates a subtle glow around your garden without creating harsh shadows or dramatic effects that can distract from the natural beauty of your plants or hide your flowers in dark spots. Lining the edge of your garden or flower bed with lights also outlines a path throughout your yard, helping prevent your plant life from being trampled at night. For smaller areas and stand-alone plants, a single overhead or in-planter light can usually suffice. Again, soft, low light is the key. The last thing you want to do is drown your flowers in a flood of harsh, overwhelming light. Remember, you want to enhance the natural beauty of your yard, not distract from it. If your yard is filled with beautiful, healthy trees, then you’ve hit the jackpot. There are so many ways trees can be used to add stunning illumination to your yard at night. While we could go on and on about tree lights, we’re going to address just two of the most common techniques here. 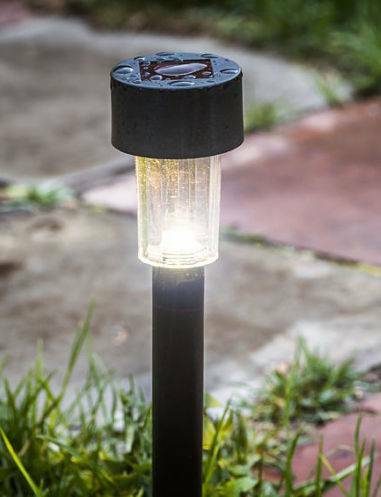 We consider in-ground lighting a landscape staple. It is low profile and does a great job of highlighting single trees and standalone features from below, but in a way that is more natural and less dramatic than shadowing and silhouetting techniques. If you have a single tree, or even a row of small trees, you’d like to easily showcase at night, in-ground lights are the way to go. If you want to get a little more creative with your tree lighting, above-ground effects like canopies and hanging lanterns are a fun way to go. Canopy lighting – stringing lights from one tree to another – is especially popular for its cozy effect and almost pergola-esque feel when strung above a patio or deck. Our team can come out to your home and discuss ideas for creating beautiful outdoor lighting in your yard. Call us for a to schedule a free quote at (847) 566-0099.